Scathophaga stercoraria, more commonly known as the Yellow Dung Fly or Golden Dung Fly, is one of the most familiar and abundant of flies in many parts of the United Kingdom. As its common name suggests, it is often found on mammal faeces, most notably that of horses and cows. From 5 mm to 11 mm in length, the adult males of Scathophaga stercoraria are bright golden-yellow with orange-yellow fur on the front legs. Females are a little duller in colour, with pronounced green-brown tinges, and lacking the bright coloured fur on the fore legs. The adults are predators on smaller insects, mostly other Diptera, and they will also feed on pollen; but most specimens seen on flowers will be hunting prey there. 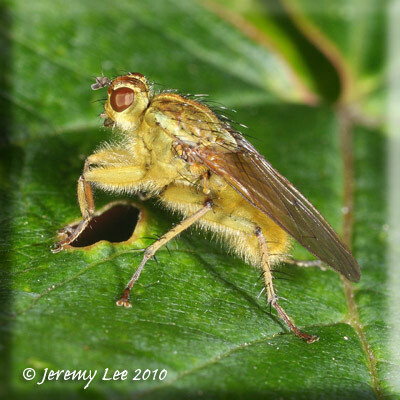 Both males and females are found on dung, the males only feeding on other insects that visit dung, such as blow-flies. Females will be there both to feed and oviposit on the dung surface.